This easy cheesy Four Cheese Baked Artichoke Dip is gloriously gluten-free and perfect for holiday entertaining. With holiday season in full swing, we’re always in need of a few quick and easy appetizer recipes to take to parties and potlucks. Creamy baked artichoke dip is always a crowd pleaser and is ridiculously easy to make! I’ll even include a few tips and tricks for making this tasty dip in advance to make your party prep a total breeze. Since we’ll need some tasty dippers for our sassy baked artichoke dip, I’ve teamed up with the folks at Crunchmaster® crackers who make the most AMAZING gluten-free crackers! Their whole grain multi-seed crackers have been a staple in our pantry for years as a guilt-free snacking option my entire family adores. Read up on their rock star nutrition stats here. With key ingredients like flax seeds, sesame seeds, and quinoa, we’re totally crazy for these whole-grain crackers! They pair great with classic holiday dips like this baked artichoke dip and are equally amazing paired with healthy hummus, avocado dip, and white bean dip. With so many tasty cracker varieties to choose from, you’ll never have to nosh on the same snack twice. Mix it up and snack happy! 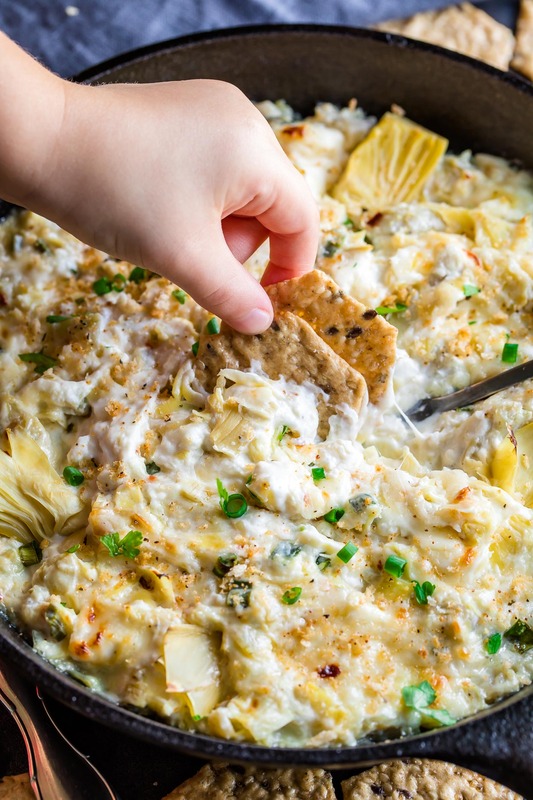 Of course this easy cheesy four cheese baked artichoke dip is so good I could pretty much eat it a million times and be perfectly okay with it! So. Flipping. Good. This quick and easy recipe can be made ahead and is sure to vanish fast! When it comes to this easy peasy artichoke dip, you can easily customize the flavor profile by choosing regular jarred artichoke hearts or marinated. The marinated veggies are extra flavorful (I opted to use them for my dip – SO GOOD!) while plain will yield a more classic artichoke dip, similar to what you’d find in a restaurant. Both are delicious options so totally let your taste buds be your guide here! Snag a bag of Crunchmaster Original or Roasted Garlic crackers and get ready to dive on in! 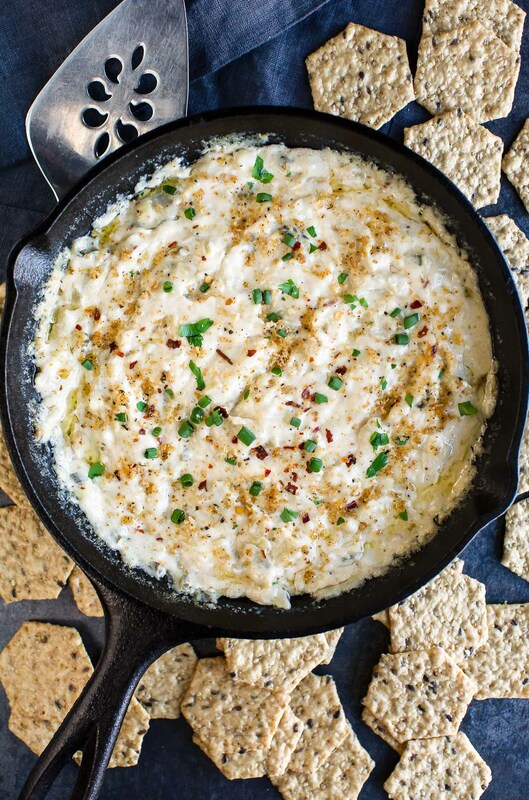 This bubbly hot artichoke dip yields 4 cups of party-ready deliciousness! In a large bowl, beat cream cheese with an electric hand mixer or simply employ some serious elbow grease to mix well until smooth. Stir in yogurt or mayo, then add remaining ingredients and mix well. Transfer dip to a shallow baking dish or small casserole pan and bake on center rack for 20-25 minutes until hot and bubbly. If adding optional GF Italian breadcrumbs, toast them on a skillet while your dip bakes. Once golden, set aside for sprinkling on the piping hot dip. Green onion or parsley may be added as a colorful garnish if desired. Dive in with a pile of your favorite GF Crunchmaster crackers! Hot artichoke dip is typically made with mayonnaise. You can use half mayo + half yogurt or opt for all yogurt in place of the traditional mayo. Half sour cream + half mayo or half sour cream + half yogurt also works great here and we've had it every which way. Skip reduced fat or fat-free dairy here keep the dip creamy and luscious since it melts evenly and stays together like a dream. I used marinated artichoke hearts but regular shall work too! See post below for more cheese options for this dip. 1 cup Gruyere or 1 cup Fontina may be used in place of half of each if desired for a 3 cheese artichoke dip. Follow steps 1-4, then cover bowl and place in fridge until ready to bake/serve. Bring to room temperature (will take longer if baked straight from fridge) and bake for 25 minutes at 350 F or until hot and bubbly. Extra cheese may be sprinkled on top before baking if desired. Dip is best served freshly baked. Both marinated and classic jarred artichokes will work great in this recipe. The parmesan and cream cheese are a total must here (I couldn’t imagine this dip without them!) but feel free to swap around with the Gruyere and Fontina. Mozzarella, Havarti, and Gouda cheese are all are fabulous options and melt like a dream! You can simplify your cheese game by opting for parmesan plus only Gruyere or only Fontina, or even all mozzarella. or this particular recipe, I’d steer clear of using fat-free or even reduced fat dairy options. The skimming and additives involved may very well cause the dip to separate. For the shredded cheese, freshly grated yields best results and even melting goodness. Ga-Ga for garlic? Try adding buttery roasted garlic to the mix! Shallots are scrumptious and caramelized onion would also be super tasty swirled in to this dip as a twist on the classic. For an extra-golden topping, pop dip on the top rack under and set to BROIL on HIGH for 1-2 minutes until browned and bubbly. Grab some whole grain Crunchmaster crackers and dive into this delish dip! This post is sponsored by Crunchmaster® crackers on behalf of TH Foods. The opinions and text are my own. Thank you so much for sharing! I definitely love artichoke dip and that’s really the main way I eat artichokes. These look so delicious though! Can’t wait to make them at home! I have a slight problem with your WEBSITE…EVERYTHING looks and “sounds” so delicious i get dizzy and want to make them all! Right now, in my toaster oven is your cubed butternut squash with fresh cranberries finishing up before i add the feta, honey and cinnamon! Seriously, I Think I would pick any of your recipes to serve to guests without even trying them out first. 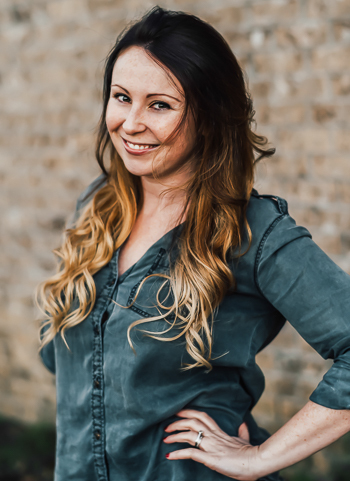 It May be old fashioned, but, you rock Jenn! Thankyou and keep up the good work! Thank you! Thank you! 🙂 I’m beaming at your sweet comment and hope you adore the butternut squash recipe! I am absolutely a sucker for a good artichoke dip. This looks great. I love artichocke evrything! But this dip is really the best! Those crackers look amazing for any dip or even a quick snack! Can’t wait to try them when I make this dip. Yum!! I love cheesy dips!! My absolute indulgence. Artichokes make IT EVEN BETTER CAUSE I LOVE THEM.sAVING FOR LATER. i love artichokes. So many flavorful cheeses in there. Artichoke dip is my favorite! Love the different cheeses in this one! Definitely need to add this to our next game day menu! Thanks Jessica! The four cheeses are def awesome here, especially with those crunchy little crackers – yum! So many wonderful variety of cheeses go in this dip! amazing recipe and wonderful clicks too. Oh my goodness this looks so incredibly yummy! 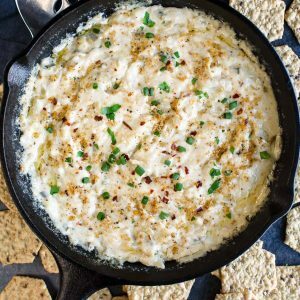 Love an artichoke dip and your version looks like a winner, can’t wait to try it! Thank you Chris!! 🙂 Can’t wait for you to try it! Artichoke dip is my absolute FAVE! This one looks sooo scrumptious! Thank you Allison! This time of year I’m all about the artichoke dip! I love cheese dips! This one looks and sounds delicious especially with all the different cheeses in it. I need to check out the crackers too; They look great! Thank you Marie! The crunchy crackers are a perfect pairing for this delish dip!